in Social Media with tags Facebook, instagram, Pinterest, Snapchat, social media marketing, YouTube Both comments and trackbacks are closed. We’re half way through 2017 and many of our social trend predictions from last year have started to materialize with expedited roadmaps towards mainstream augmented reality and options for in-feed shoppable content. New trends have also started to emerge like the importance of brand safety and the anticipated ‘attack’ on television. At this halfway point, we have identified three trends in particular that marketers need to be keeping an eye on and planning for: 1) Communal Social Experiences 2) Social Platforms Encroaching on Traditional TV’s Territory and 3) Opportunities to Complete the Consumer Journey in Social. Social platforms are returning to their roots and creating more opportunities for users to have interactive experiences with like-minded people. While each platform has mastered the art of bringing users together, they are now integrating new technology to make these experiences more impactful for the consumer and for brands. Facebook Messenger’s virtual assistant, M, joins group conversations. M uses AI to offer suggestions and can streamline your group conversations by automatically making plans, sharing your location, starting a poll, and even sharing an Uber or Lyft. Instagram and Snapchat compete for curation. Snapchat rolled out Story Explorer and Custom Stories, bringing people in similar locations together. Story Explorer uses machine learning to stitch together UGC and makes it searchable based on location and Custom Stories allows users to curate personalized stories for their privately-hosted events. Taking a similar approach, Instagram rolled out clickable locations and hashtags for stories, creating a destination for geo- or interest-specific communities. Tumblr and Facebook encourage group video viewing. With Tumblr’s new standalone app, Cabana, users can group chat and watch YouTube videos together in real-time. Similarly, Facebook rolled out Live Chat With Friends, which allows users to invite friends to a private chat about a public live broadcast. A surge of emerging apps are forming in the name of group experiences. Gobi allows users to form a group and streamline photo and video sharing. Similar to the ephemeral nature of Snapchat, content on Gobi only lasts for three days. Uptime is similar to Cabana and encourages group YouTube viewing. Virtual Reality brings people closer together. Facebook Spaces, an Oculus Rift app, allows you to hang out with your Facebook friends while sharing VR experiences as if you were in the same room. While this experience is limited to those who own an Oculus Rift, brands and users can immediately take advantage of augmented reality with Facebook’s Camera Effects platform and Snapchat’s World Lens. Stay Social. Social platforms were created to bring people closer together but as they grew, advertisers started to care more about the reach rather than the rich human experiences happening in the space. While paid media is still needed to reach consumers at scale, it is less about “pay to play” and more about “pay to enter.” In today’s landscape, marketers need to strike the balance of community management (the heart of social) and advertising (the brain of social) to create a symbiotic community (the soul of social). Once a brand has an established presence, they should plan their brand moments around the interests, actions, and needs of their unique communities to ensure that marketing efforts are efficient. YouTube joins forces with broadcast television in YouTubeTV. This platform allows users with a cable subscription to broadcast channels via the platform. This product creates new ad space for YouTube and enables YouTube to act like an algorithm-based streaming service (e.g. Netflix, Hulu, etc.) Using YouTubeTV, the platform can collect data during recorded broadcast content and suggest relevant YouTube-owned content to drive time-spent. Twitter continues to cater their platform to cord-cutters with increased live streaming partners. Twitter has added the NBA, MLB, Live Nation and more to drive more real-time conversation and time spent on the platform. Facebook plans on creating original video programming. To compete with the Netflixes, Amazons, and Hulus of the world, Facebook is ramping up to publish their own premium video content on the platform. Continue to leverage video. As of now, there are many unknown variables within this trend that may impact television consumption and the social landscape. However, we do know that video will continue to be prioritized across platforms and creative storytelling will be paramount. Marketers should explore opportunities to advertise within these experiences in relevant ways – ex. pre roll or in video ads. Proactively prioritize the space. Television viewers are getting more comfortable watching their favorite shows on new devices and platforms. 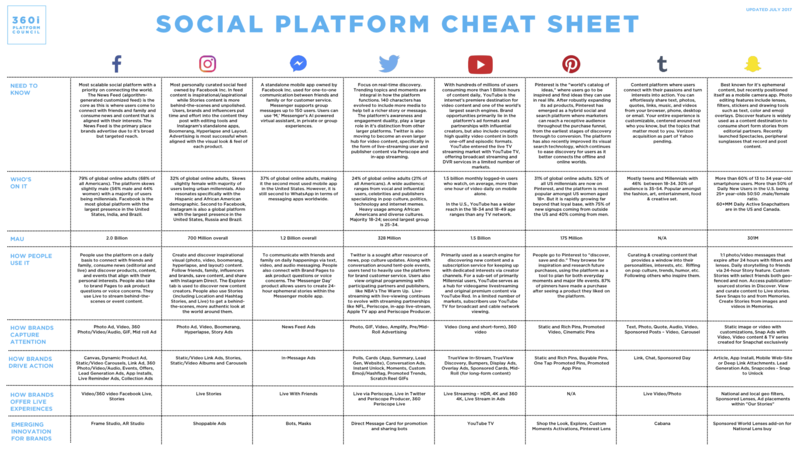 Just as entertainment brands adapted their distribution strategies for video on demand (VOD), they should start thinking about utilizing social in a similar way. Social has proven to impact on the consumer journey, but with opportunities to better connect storytelling to conversion and more accessibility to data, social is in the position to drive more measurable results. Pinterest started this trend back in 2015 when they launched Buyable Pins, but Facebook, Instagram, Snapchat and emerging platforms are putting their own spin on the experience. Snapchat links ad exposure and in-store traffic with their Snap to Store product. Adding location tracking allows brands to correlate people who see their Snap Ads with those actually shopping in-store. Snapchat gets more granular in their targeting to optimize results. The Audience Match program allows brands to leverage owned data (i.e. CRM lists) and target qualified users and platform retargeting allows brands to target Snap Ads to people who have previously been exposed to a branded lens or geo-filter and vice versa. Facebook Collection Ads enable brands to inspire and drive conversion all in one post. Collection Ads give advertisers the option to use an inspiring lifestyle photo or video alongside the products available for purchase. If a brand does not have a product catalogue linked to its Facebook Ads account, they can link to one or multiple product-focused Canvas Ads. Instagram and Pinterest encourage users to discover new products. Instagram’s Saved Collections is an improvement on the Instagram “Save” button and allows users to organize their saved content (i.e. Travel Bucket List, Products I Love, etc.). Pinterest’s Shop The Look feature allows users to select specific elements from a pin’s image and shop similar products on the platform. Pinterest plays into instant gratification with Lens. Pinterest’s visual discovery capabilities allow users to snap a picture of products in the physical world and get served product pins that can be saved or clicked to buy. Tell a story that converts. Leverage platform capabilities that inspire consumers to take action with your brand. Whether this be ad units that enable in-feed shopping or a meaningful video, connecting consumers to the overarching brand story will make conversions more efficient and transform fans into loyalists. Overall, we anticipate that this is just the beginning and we’ll continue to see these trends shape the social landscape throughout 2017. 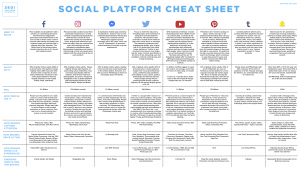 The below cheat sheet includes the latest social platform information and should be used by marketers deciding which platform to activate on (who is on it), how they should relate to their consumers (how people use it), and what type of content they should create based on business objectives and purchase funnel. 360i’s Social Marketing Supervisors, Amy Donnelly and Valentina Bettiol also contributed to this post.